Editing for a new journal? Don’t mind if I do! Exciting professional news! I just accepted a position as a language editor for the open access journal Smart & Stimuli Responsive Materials. It’s a part time position, largely focused on improving the clarity and readability of submitted papers. Every famous editor has to start as a copy editor, huh? I do find it a bit curious that I have no aspirations for academic positions after my PhD, yet here I am entrenching myself into academia a bit deeper. But such is life. It’s a brand new journal, non-traditional in the sense that it’s open access, and rather specialized. So it probably won’t be barnstormed by folks quite yet. But I’m optimistic! And excited to be contributing to the open access scene. One acceptable answer to the title question comes, of course, from Outkast. The other comes last week from Simon Braun and Dr. Ulrich Scheider’s group at Ludwig-Maximilians-Universität, who finagled some potassium atoms until they were colder than absolute zero. I’ll let that sink in. Colder than what is the coldest temperature possible. As the Governator once said: Alright everyone, chill! Your first reaction is probably: ….what. That doesn’t make any kind of sense. Isn’t absolute zero the temperature where all atoms and particles just freeze solid? No more motion, no more energy. How can you get colder than that? To answer that, it helps to remember what temperature is, from a physics perspective (instead of maybe a smartphone app perspective). Temperature is really just a number representing how much energy a system has. Are the atoms bouncing and flipping out like a Jackie Chan flick? High temperature. Are they slow and solid enough to build a snowman out of? Low temperature. But usually it’s not that simple. Even at one specific temperature, say 27.2F (the temperature outside my apartment right now), a small handful of atoms (or particles or molecules) have high energy, while most of them have lower energy. 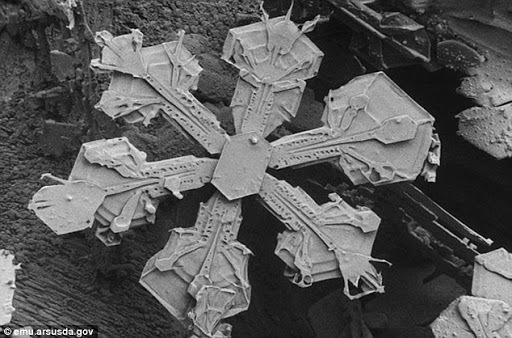 The atoms in that snowflake definitely aren’t Jackie Chan. Here’s a useful analogy: the majority of people across the world are lazy. The Elon Musks and Tina Feys and Ghandis are very rare. Probably why we find them impressive and inspiring and hilarious. On a given night, most people would much rather grab some drinks, lounge on the couch, and catch up on Netflix than, say, assemble a massive undertaking to solve the unsolvable inequalities of the world. Small atoms are the same way. The vast majority of them are in the lowest energy state – passed out with bowl of cheetos in their cozy electron blankets, if you will. Then there are a few rare ones that jump up and do a Robin Williams routine. I’ll give you time to get blood flowing back through your fainted grandmothers. Good? The details of the equation aren’t important. But what is important is to notice is that the number of atoms with a certain energy, the symbol n, depends on temperature (plus a bunch of other things) which I highlighted. Bringing it back full circle, this a way we can unambiguously define temperature. It’s the quantity that gives a bunch of particles their specific energy. If you’ve got more high energy Robin Williams-particles, that’s a higher temperature. A very convenient side effect is that now you’ve also got a number to tell your friends to let them know how blisteringly cold it is in the morning. Back to Simon Braun and colder-than-absolute-zero potassium. What he and his group did was get some potassium atoms good and frosty while trapping them in a very high energy configuration. For this part they got to use all sorts of cool-sounding physics tools like anti-traps and superfluid transitions. So they now had very cold atoms, trapped in a high-energy phase. Now the exact details of what happened next are beyond me, but as I can figure it, they could use what they knew about the distribution of energy (a cousin to the equation above) to figure out what statistical “temperature” defines such an arrangement. And lo and behold: less than absolute zero! At this point it’s tempting to get a little agitated. “Hey, that’s just splitting hairs over how you define temperature!” I know I wanted to at first. But when you realize that this result comes from what thermodynamics tells us temperature physically is, it opens up some really fascinating questions about how quantum things (the very smallest, seemingly most basic particles you can have) play nice or don’t play nice with the way we understand thermodynamics. Regardless, someone needs to get Outkast on the phone and tell him to write Hey Ya v2.0. Where do all the theses go when their parents leave them? This post about open access grad student theses is a worthwhile read for grad students and bosses: The dissertations that get away (& where they end up, and why). It makes specific note of the company ProQuest, which does a lot of thesis publishing and has an “open access” option, and the newer FigShare, a cloud-based open access publishing service. With some hesitation at the cost of $95, I did pay the “Open Access Publishing PLUS” fee upon filing my dissertation, so it comes as something of a surprise to learn that my dissertation does not appear in the ProQuest database. I know that I’ve often found students’ Masters and PhD thesis to be more helpful in my work than published journal articles. They tend to be much more thorough about experimental setups, what the relevant background is, and all sorts of other details. And I know tracking them down can be tough. When I find one that seems interesting (which itself is not as simple as I’d like), more often than not I need to get the university library to track it down, and the thesis ends up on my desk pretty shortly after. Who knows what magic they use, but being able to easily find a thesis online instead of just a dusty advisor’s bookshelf would be fantastic.